James Bath is a Senior Instructor at Frontier Bushcraft and has worked with Frontier Bushcraft since 2011. 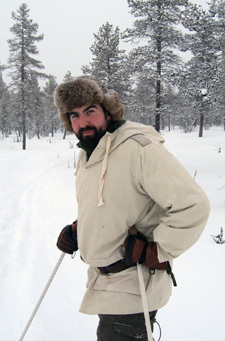 He has been involved with the instruction of bushcraft since 2005. James is one of only a few people worldwide who have been recognised by Ray Mears as a bushcraft instructor, being awarded the celebrated antler-handled Woodlore instructor’s knife. He was previously Head of Operations at Woodlore Ltd.
James is also a qualified Mountain Leader. Originally from the Lakes, early years were spent building dens in the woods, walking miles on the fells, and learning about the outdoors from his Grandad and Uncle. From a family of teachers, James has instructing in his blood and, whilst always still learning himself, is passionate about passing knowledge onto others where he can - his ‘unique’ and oft brutal sense of humour/sarcasm readily being deployed to hammer a point home. Still enthusiastic about pretty much anything outside, any spare moment is spent doing something outdoors. When forced inside James is an avid consumer of books, reading anything from field guides to old stories of exploration.